Jana Hasuna from Sirasa TV visited to Irudeniyaya to Highlight the Human and Elephant conflict. Sajeewa Sampath the coordinator of Kurunegala has organized the people to attend to the event. 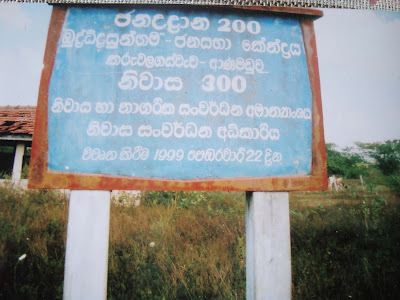 February 02nd, 1999, the Housing Development Authority and Ministry of Housing and Urban Development started a housing scheme project in Karuwalagas wewa. Here the government planned to build 300 houses to settle the Karuwalagas wewa people, providing land for them in the same location and 15,000 - 40,000 loans to build these houses. In 2002, the government designated this area as sanctuary, creating many problems for these people during the nighttime, including living in darkness because they do not have electricity. 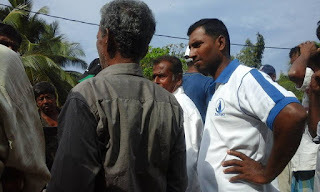 When the people requested the Ceylon Electricity Board (CEB) to grant electricity for their area, the CEB refused and said "the area is located inside the sanctuary boundary line so we cannot provide electricity for this area". Therefore, the people have now filed the case regarding this problem in the High Court, as according to the Sri Lankan Law, everyone has a right to receive electricity. The people gathered money among the affected people who are living in the same community. When there was a shortage of money, Praja Abhilasha became involved by taking up this case and providing legal and financial support for them. The affected people went to court on 11th December, 2008. Lawyer Mr.Sunil Coorey and Mrs.Muthitha Premachandra are appearing on behalf of the people. Human & Elephant conflict is a burning issue in Sri Lanka. Now most of families , specially farmers lost their livelihood and lives. lot of people have been killed by elephant during the last year. most of those areas are forest areas which was declared as a santuary by government.